In the wake of the riots following Dr. Rajkumar’s passing away, Bangalore has been witness to disturbing levels of paranoid hysteria. 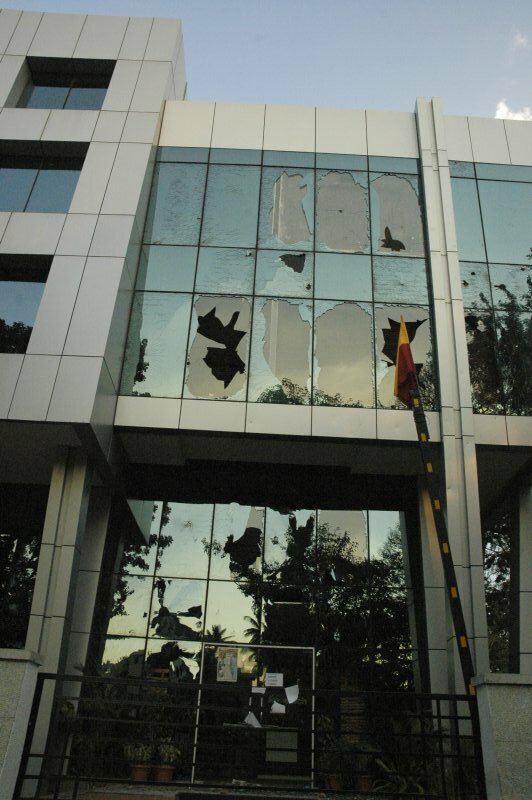 I got some pictures of Talisma office being ransacked during the riots in Bangalore last week, following Rajkumar’s death. I believe that’s solid proof that IT companies were indeed targetted. I blogged about it; but I thought publishing the pictures on Bangalore Metblog would give it wider reach. This was submitted by a reader of this blog, who has blogged about it here. Evidently, this person is rather ignorant of the notion of statistical sampling. During 2002-03, Bangalore had 1154 Software Technology Park Units. The numbers as of now are arguably considerably higher, and these numbers do not take into account non-STP units. What is interesting is that only 3 IT companies were actually the “targets” of the mob violence. Besides loss of productivity due to the shutdown, some companies in the vicinity of Dr Rajkumar’s home in Sadashivnagar such as Microsoft Research, Aditi Technologies and Talisma suffered damages as vandals picked them up to target their ire. 3 out of 1154. This in itself should trash the notion that any “targeting” of IT companies took place. What did take place, however, is something every 8 year old child is well acquainted with: the impact of a rocky projectile with glass window panes. What’s common between the two buildings you say? For one, they are both in Sadashivnagar, which is where Dr.RajKumar’s residence is. Secondly, glass. Lots of glass. Huge glass facades which invite stone throwing during a riot. Given a choice, would a rioter hurl a stone at a plain brick and stone building, or one with glass facades? Of course, aforementioned paranoid hysterics will conveniently fail to mention that a lot of property in the Sadashivnagar area was attacked, IT company or not. For that matter, stones were pelted even at Dr. Rajkumar’s neighbour’s houses! Saying that IT companies were “targeted” by the rioters, is like saying that a stampeding herd of elephants was targeting the other jungle animals it trampled over. I do understand that many people were rudely jolted out of the fact that Bangalore is not the paradise on earth they were told it was before coming here. We would do well to remind ourselves that Bangalore is in India, and faces the same fundamental issues that the rest of India does. IT man dies in bike accident, IT man’s house ransacked, IT man makes an attempt at philanthropy, IT man makes it to page 3,famous renowned theatre artist marries IT man!, IT this IT that..they aren’t a minority any more. They are so many in number that every other thing that happens in the city revolves around them. So statistically speaking its OK! Wow, an emotional denial has been wonderfully disguised as a logical argument! Oh Master of Statistics, could you present us with the number of non-IT companies that were attacked in a similar manner? Then, you could extrapolate it with your supreme knowledge and refute my claim. Focussing on glass, your limited sight seems to be on display. Was glass the only thing that seemed destroyed, from the pictures? Or have you just put only one picture that suited your argument? I didn’t intend to have any convenience in my argument. I published the only pictures that I got. Also, if you care to notice, the title of my post has a question mark. That translates to doubt. I am open for debate, but not for a I-gotta-put-you-down bashing. I am ready to be convinced by your argument. When Rajkumar was abducted, similar riots took place. My company was threatened to close down. When our US counterparts asked why the company was closed down on Thursday, could I have said “a famous actor died and riots have broken out”? My intention is not to malign Bangalore. But I believe in highlighting the bad along with the good. Last but not the least, I used the “Suggest A Story” feature on Metblog. I did not ask for my post to be highlighted, but only for the pictures to be published. My point of view isn’t necessarily important. But is this the way a contribution to a community site is going to be treated? Every second petty shop in that locality and NW Bangalore that was open? Anyway, the burden of proof is squarely on you since you asserted the entire “targeting IT companies” claim, and backed it up with statistically insignificant evidence. More FUD. In case you care to notice, whatever was broken in the pictures, was bang next to glass windows. For example, those two desks at the end of your post are bang outside broken windows, and have glass shards all over them. Stone hits glass. Stone goes through glass and shatters it. Stone proceeds to hit whatever is past the glass. No brainer that IMO. Also, if you care to notice, the title of my post has a question mark. That translates to doubt. Your title was: “IT companies weren’t targetted in Bangalore riots?” which actually supports the claim that there was targeting. A neutral title would be “Were IT companies targeted during Bangalore riots or not?” or in a similar vein. Besides, the tone of your post itself is pretty free of doubt. Thanks for introducing the Red Herring. My engineering exams were postponed when the kidnapping happened. I couldn’t get chaat near my house which upset me greatly. Now how does that have anything to do with the targeting of IT companies by rioters a.k.a the topic currently being discussed? Understood. I found your treatment of the topic highly objectionable and flawed. I responded to it. Are you suggesting that it is innapropriate to link to your post and criticize it? I must assure you that I was not trying to make a personal attack here. Given that we are trying to have a meaningful debate on the issue, it is only right that I link to your post on the matter, in order to establish a proper context for readers. And BTW, whats the copyright status of the images on your blog? Are they public domain? Sounds like you are lesser than even 8 years old, Ambar. Atleast that is the level of maturity (read immaturity) that you’ve displayed by this blog post and all those stupid comments. Everyone is entitled to an opinion, there is no need for mud-slinging. Good title – Fear by others and stupidity by you. randramble ~ “disturbing levels of paranoid hysteria.” to complete the sentence “Bangalore has been witness to disturbing levels of paranoid hysteria.” sounds more like a generalization. “…something every 8 year old child is well acquainted with…” a very dispassionate analogy. “I am referring to those who, enveloped in their completely self-centered fear, lose all sense of perspective and make statements like…”..emphasize on the last three words ” make statements like” directed towards the verbiage. So Ambar’s words do rather appear to be impersonal. Anonymous/XYZ: If you do feel like abusing me, whats the need to go comment on my blog? Please post them here so they can get all the readership they deserve. It’ll also save me the trouble of opening two different comment pages. Sigh. On the contrary, you’ve won the argument, using the martyrdom technique. Congratulations! And why do you think that the statement about 8 year old children and stones was referring to you? Cut the crap guys, you are all acting very stupid now, and it shows. Why are you targetting someone who just wanted to put up some snaps on his/her blog? If you have to get back at anyone, its the rioters and the system. Why are you all wasting your time, energy and resources of this site? It is such brainy homo sapiens that screw this country. ALL YOU BLOODY IDIOTIC PEOPLE. SHUTUP! Most of the folks in the IT sector have an inflated sense of self-importance, so I guess it goes with the territory. You know what I hated the most? The collective sense of “lets go home”, and of spreading rumours. The rumours I heard practically put Bangalore as being totally aflame. sakkataagi bardidya maga…keep it up.